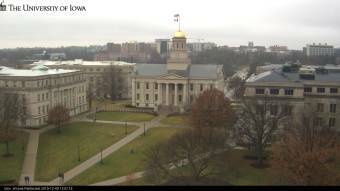 It's 22:06 in Iowa City, USA right now. Iowa Old Capitol Building View onto the Iowa Old Capitol Building on the campus of the University of Iowa. Coralville, Iowa: Iowa River Landing, 3.7 miles away. Waterloo, Iowa: Cedar Valley Tech Works, 71 miles away. Dubuque, Iowa: Hotel Julien, 73.1 miles away. East Dubuque, Illinois: Riverview Terrace, 73.3 miles away. Cedar Falls, Iowa: Cedar Falls Utilities, 76.4 miles away. Altoona, Iowa: Prairie Meadows, 99.9 miles away. Freeport, Illinois: City View, 107.5 miles away. Ames, Iowa: Iowa State University, 110.7 miles away.